Establishment No. 22 is a military establishment that represents a military pact/alliance between the United States, India, and the Tibetan Government -in-Exile. It came into existence during November 1962 and during 1966, this organization was named Special Frontier Force. Between the Central Intelligence Agency and the members of Special Frontier Force there has been a Master-Student relationship. This organization is the child of CIA’s Secret War in Tibet and it will be correct to recognize CIA as the ‘Mastermind’ of this operation to defend Freedom, and Democracy in the occupied Land of Tibet. The Spirits of Special Frontier Force take this opportunity to pay a special tribute to its ‘Master’, John Alexander McCone(b. January 04, 1902 – d. February 14, 1991) who served as the Director of CIA from November 1961 to April 1965. Whole Dude-Whole Master: This is a special tribute to Spymaster John Alexander McCone who served as CIA’s 6th Director from November 1961 to April 1965. John A. McCone obtained a bachelor’s degree in Mechanical Engineering from University of California at Berkeley. He built his career in the steel, construction, shipping, shipbuilding, and aircraft production industries. He founded the Bechtel-McCone Steel Company and his role in shipbuilding, and military aircraft production had attracted the attention of President Harry S. Truman who had appointed him to the Air Policy Commission in 1947 to develop strategy for American military airpower. During 1948, he was appointed as the Special Deputy to the Secretary of Defense. In 1950, he was appointed as Undersecretary of the Air Force. President Dwight Eisenhower appointed him as the Chairman of the Atomic Energy Commission during 1958 and held that position until 1961. 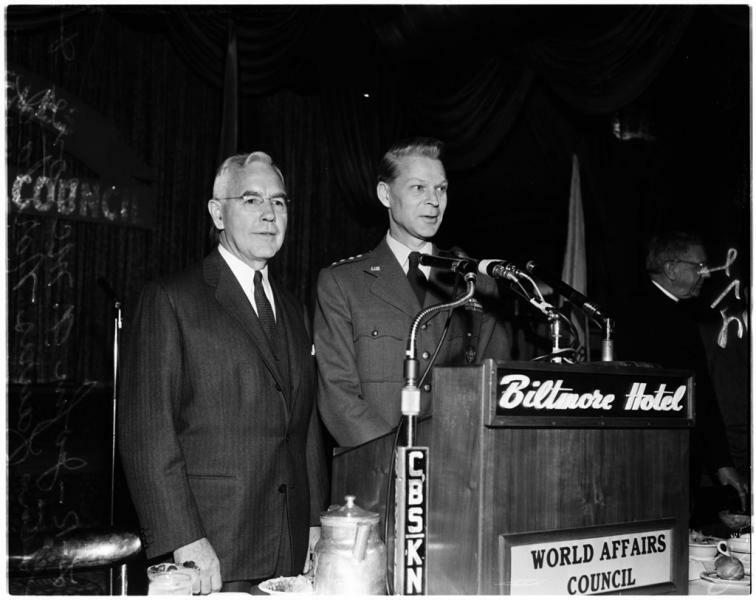 Whole Dude-Whole Master: In this photo taken during 1958, John A. McCone, Chairman of the World Affairs Council is seen with General Lauris Norstad, Supreme Commander of the Allied Powers in Europe. 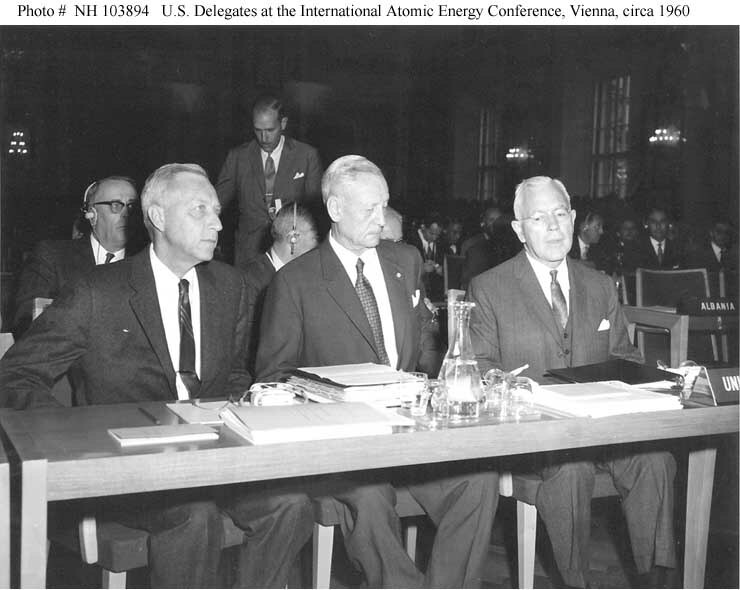 Whole Dude-Whole Master: U.S. delegates to the Fourth General Conference of the International Atomic Energy Agency, Vienna, Austria 1960. Left to Right:- Ambassador John S. Graham, Vice Admiral Paul F. Foster, US Navy(Retd), the Permanent U.S. Representative to the IAEA, and John A. McCone, Chairman of the U.S. Atomic Energy Commission. During his tenure as the Chairman of the U.S. Atomic Energy Commission, John McCone made very significant disclosures about Israel’s nuclear capabilities. After the disaster of the Bay of Pigs Invasion of Cuba, President Kennedy forced the resignation of the CIA director Allen Welsh Dulles and Richard Bissell, the Deputy Director for Plans and Operations who had a major role in making the plan for this CIA’s Black Operation. In a very surprising, and sudden move, President Kennedy called John McCone, a Republican to take charge of the Central Intelligence Agency disregarding the fact that McCone had no prior experience in Intelligence. Whole Dude-Whole Master: President John F. Kennedy’s selection of Spymaster during 1961. Left to Right:- Allen Welsh Dulles, 5th Director of CIA, Richard Bissell, Deputy Director of Plans/Operations, President John F. Kennedy, and the newly selected 6th Director of CIA, John A. McCone. Whole Dude-Whole Master: September 27, 1961. 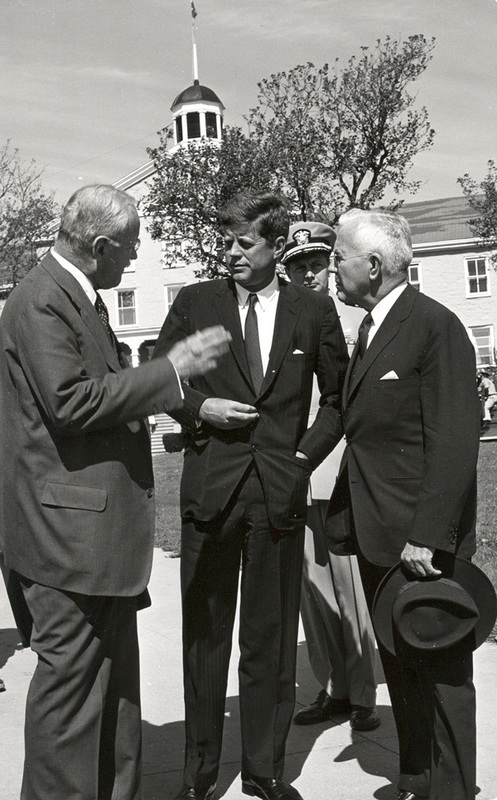 President Kennedy with CIA Director Allen Dulles and his new pick, John A. McCone. Whole Dude-Whole Master: November 29, 1961. 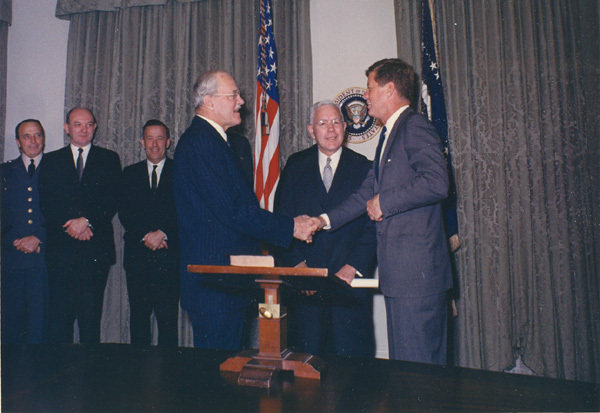 President John F. Kennedy with outgoing CIA Director Allen Dulles. Whole Dude-Whole Master: November 29, 1961. 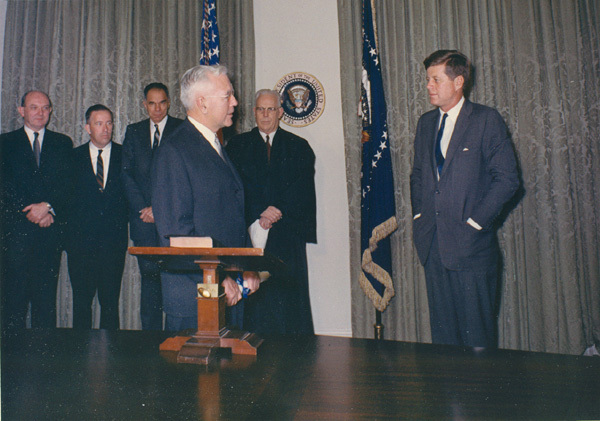 President John F. Kennedy welcomes the 6th Director of CIA, John Alexander McCone. Whole Dude-Whole Master: John Alexander McCone gets the task of “rebuilding” CIA after the Bay of Pigs debacle. Whole Dude-Whole Master: A new chapter in the history of CIA. 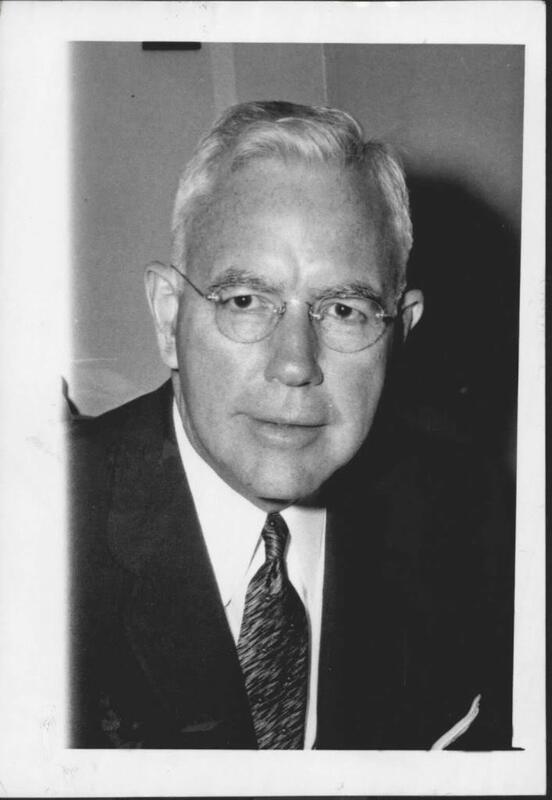 John Alexander McCone became the “Government’s principal foreign intelligence Officer” and he would work the heads of all departments and agencies, such as the State, Defense, the Attorney General, and the Chairman of the Atomic Energy Commission, that have responsibilities in the foreign intelligence field. 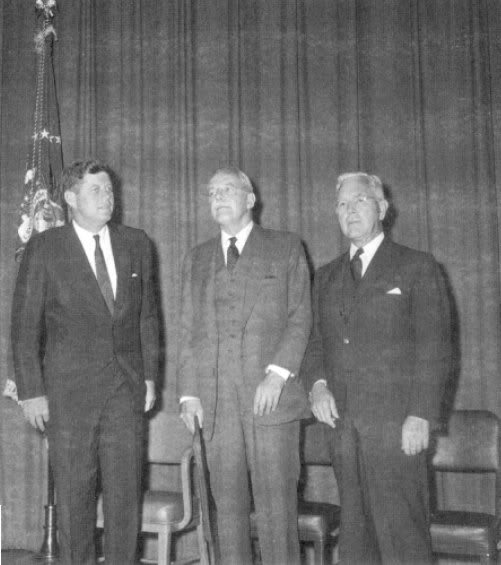 In this photo McCone is seen with Robert Kennedy, the Attorney General. 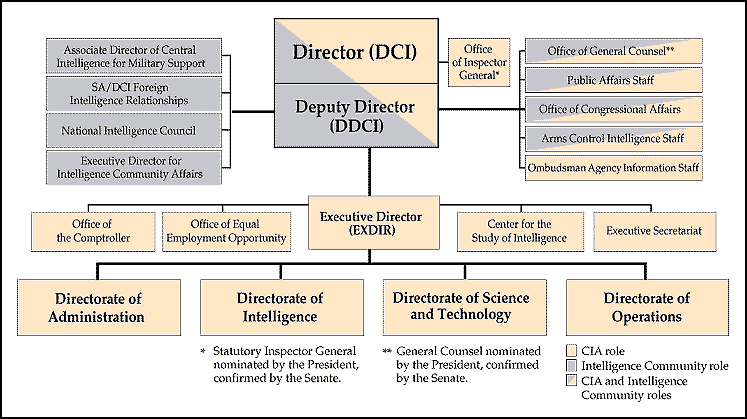 The DCI would coordinate and direct the total intelligence community. John McCone played a leading role in strengthening the intelligence gathering abilities of CIA by launching a technological revolution. On August 05, 1963, he created the Directorate of Science and Technology. Whole Dude-Whole Master: May 01, 1964. Presidential candidate, New York State Governor, Nelson a. Rockefeller gets Intelligence briefing. 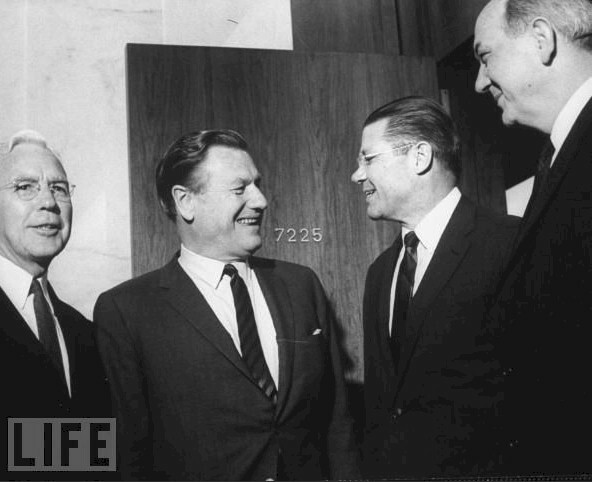 Left to Right:John McCone, DIC; Governor Nelson A. Rockefeller; Robert S. McNamara, Defense Secretary; Dean Rusk, Secretary of State. Photo credit: Francis Miller/Time & Life. McCone was responsible for a number of covert operations in Vietnam, Laos, Cuba, Ecuador, and Brazil. John McCone was present in the meeting held at The White House on November 19, 1962 to enter into an agreement/pact with India, and the Tibetan Government-in-Exile to formulate Establishment No. 22/Special Frontier Force to address the military threat posed by People’s Republic of China’s military occupation of Tibet. This operation that involves India and Tibet remains a secret. 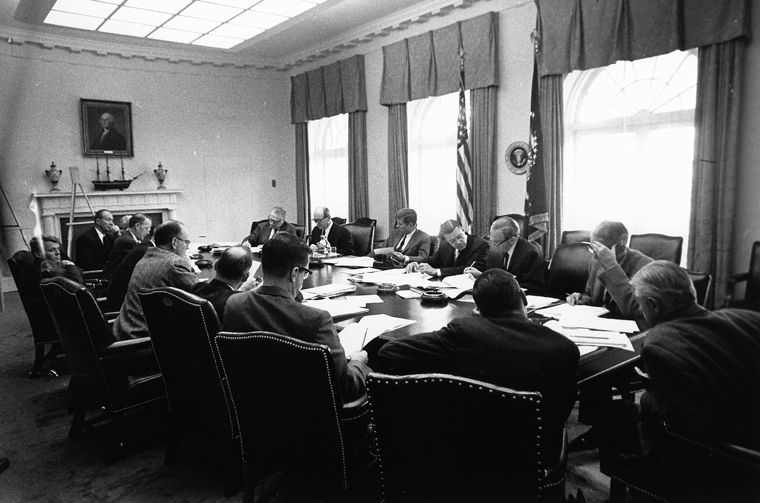 McCone was a key figure during the October 1962 Cuban Missile Crisis. He had predicted that the Soviet Union would place offensive nuclear weapons in Cuba. However, he had differences with President Lyndon B. Johnson and had resigned from his post during April 1965 and was replaced by Admiral William F. Raborn. President Ronald Reagan during 1987 presented John McCone with the Presidential Medal of Freedom. I say that John McCone was one of the best managers that CIA ever had. What do you want to say?? ?